Nothing could be easier to understand than a cash back credit card. You get a small percentage back on everything you buy on the card and the reward comes in the form of cash back, meaning money. The beauty is that you can spend these cash back rewards on anything you want. So they’re flexible too. No two cash back credit cards are identical so you need to consider the annual fee, earn rate, how much your charge to your card, and any additional benefits before you apply. To help you pick the right card, we’re sharing what the best cards have to offer based on categories. 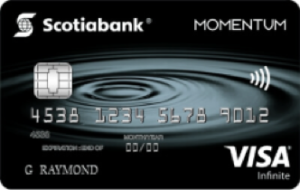 Right now, new applicants who apply for the Scotia Momentum Visa Infinite card by April 30, 2019 will earn 10% cash back on the first $2,000 they spend during the first three months of card membership. That means you could earn up to $200 as a welcome bonus. The regular earn rate is pretty impressive too since you’ll earn 4% cash back on gas and groceries, 2% on drug stores and recurring bills; and 1% on everything else. However, note that there is a cap on the accelerated cash back earnings. Once you hit $25,000 in spending on each of the categories, your earn rate drops down to 1%. This isn’t a big deal, but it’s something you need to be aware of. 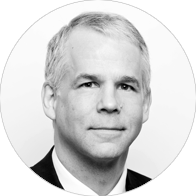 Since this is a Visa Infinite card, there is a minimum annual income of $60,000 or a minimum household income of $100,000 requirement to be approved for the card. No, your eyes don’t deceive you, the Meridian Visa Infinite Cash Back card is almost identical to the Scotia Momentum Visa Infinite card. The earn rate is the same and even the current welcome bonus of 10% and when it expires is exactly like the Scotiabank card. 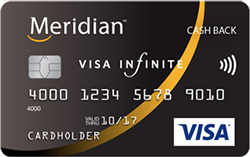 However, if you look at the fine details, you’ll quickly realize the Meridian card has a few extra features that will appeal to people. The travel insurance you get is good up to 48 days per trip which is longer than what the Scotiabank card offers and you get mobile device insurance which is another benefit that Scotiabank is lacking. We don’t want to play favourites, but there’s no denying that the Meridian Visa Infinite Cash Back has a great insurance package. 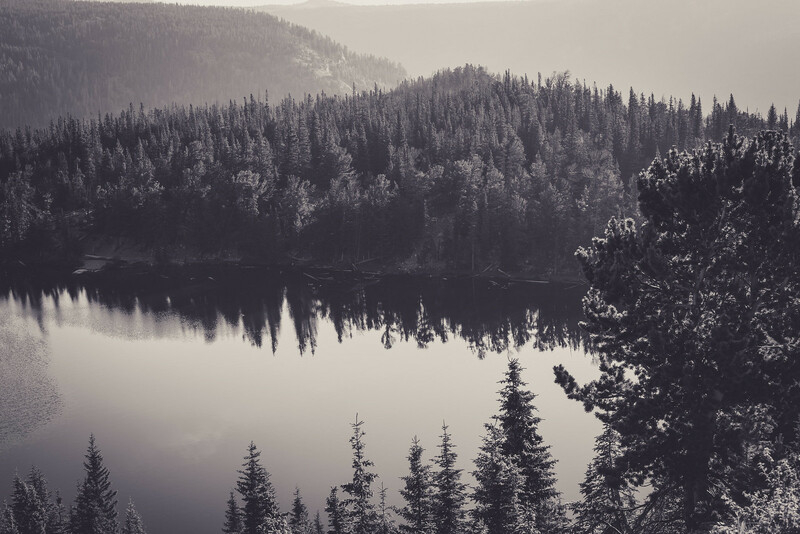 The SimplyCash Preferred Card from American Express is ideal for people who spend a lot on their credit cards and don’t want to deal with different spending categories since you earn 2% cash back on all your purchases. Although the card has an annual fee of $99, you get an increased earn rate of 5% cash back (up to $300) on all purchases for the first six months of card membership. For those looking to reduce their debt, they can also take advantage of the optional balance transfer at the time of application. The balance transfer rate is 1.99% for the first six months and you can transfer up to 50% of your credit limit, up to a maximum of $7,500. With an annual fee of $120 and an earn rate of 3% cash back on gas, grocery, and recurring bill payments, some people ignore the TD Cash Back Visa Infinite Card but that could be a huge mistake. The welcome bonus of 6% on select categories is nice, but the real benefit of this card is the included TD Auto Club membership that you get which is basically a roadside assistance package. 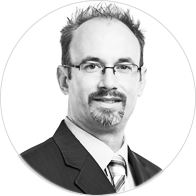 TD Auto Club is comparable to CAA and covers you for things such as a dead battery, tire changes, gas delivery, $200 in accident towing, $200 in emergency transportation, and more. When it comes to travel insurance, you only get travel medical, and delayed and lost baggage insurance which is not very good, but people apply for this card for the TD Auto Club membership, not the travel insurance. 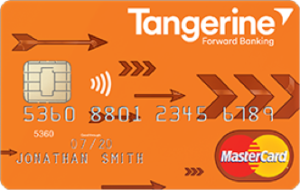 If you want a cash back card that has no fees and is easy to understand, then the Tangerine Money-Back Card is a good choice for you. All cardholder get to choose two categories where they earn 2% cash back. If you opt to have your cash back deposited directly into your Tangerine Savings Account, then you get to choose a third category that earns you 2% cash back. All other purchases earn you 0.5% cash back. Since this is a basic no fee, cash back card, the other benefits are thin. 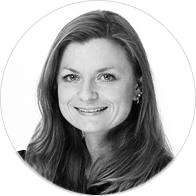 However, you do get purchase assurance which protects your purchase from loss, theft or damage within 90-day and extended warranty which doubles your manufacturer’s warranty up to an additional year. 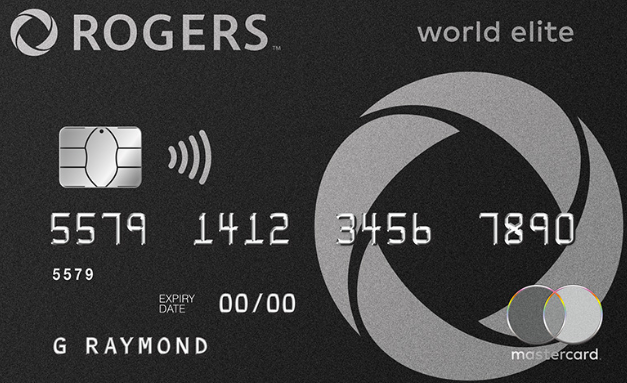 The Rogers World Elite Mastercard often doesn’t get as much love as it deserves. With this card, you earn 1.75% cash back on all your purchases. Best of all, you can redeem that cash back towards most of your purchases made with your card within the last 90 days. The 4% cash back on purchases made in a foreign currency effectively means you earn 1.5% in cash back on purchases once you factor in the 2.5% foreign exchange fee. In other words, this is a great card for travellers. Getting 2% cash back on Rogers products and services is nice and so is the basic travel insurance include, but they aren’t gamechangers. 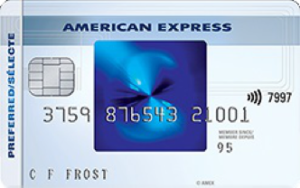 American Express also offers a no fee version of their SimplyCash card. As you can imagine, the benefits are not as great compared to the preferred version, but you still get a decent return on your spending. The earn rate is 1.25% cash back on all purchases, but that’s doubled to 2.5% on all purchases for the first 6 months (up to $150 cash back). You also have the option to make a balance transfer at the time of application with a promotional interest rate of 1.99% for six months. If you refer a friend to this card, you’ll get $100 for each approved referral up to $1,500 per calendar year. 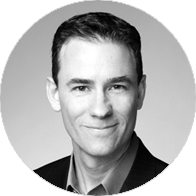 For the Best Cash Back Credit Cards 2019 ranking, MoneySense tapped into Ratehub.ca’s‡ credit card tool and calculated the numbers for both fee and no fee cash back rewards cards based on $2,000 in monthly spending. We used the following scenario: $500 on groceries, $200 on gas, $200 on restaurants, $125 on bill payments, $175 on travel, $225 on entertainment, $75 on pharmacy purchases and $500 on everything else. The end game was a magic number—that is, the annual net reward in dollar terms to identify the top cash back cards for each type of spender, along with an honorary mention. 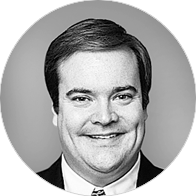 Our methodology also took into consideration other factors, including limited-time accelerated earn rates, the range of spending bonus categories, annual fee waivers, purchase protections and travel insurance perks.